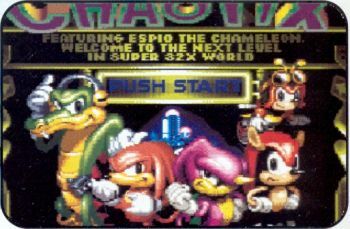 In the early title screen, it said at the top 'Featuring Espio the Chameleon'. In the final it says 'Knuckles the Echidna', possibly meaning that Espio was once the main character and Knuckles was tagging along. This panel, seen during the random level selection phase, is different to the final version. 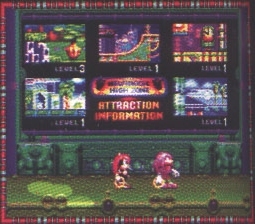 In the final the 'attraction information' bit is at the top, and not the bottom, and the level selection is in a different order. 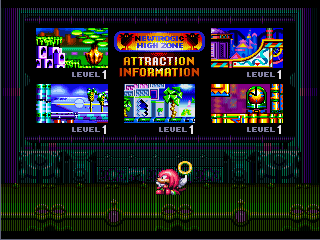 The palette for the Speed Slider Zone is also different. This one has green on the inside, but the final is more aqua, with a brighter sky. Like the image above, the attraction information section is all weird. 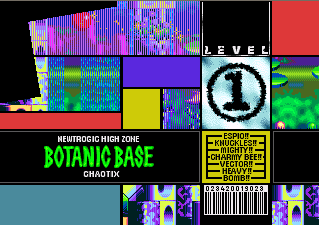 This time the Speed Slider zone palette is complete, but the Botanic Base, Marina Madness and Techno Tower images are completely different to the final. Heres the same area from the final game, and everything is placed differently and looks different. 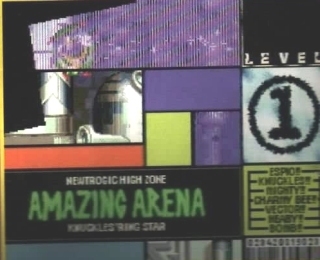 This early Chaotix title cards claims that the games name is 'Knuckles Ring Star', as seen at the bottom of the 'Amazing Arena' title. 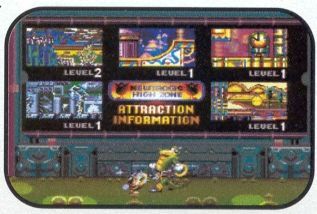 In the final game it has been changed to 'Chaotix'. Also, the name selection to the side has Espio at the top, again another point to Espio being the original main character of the game. Another noticable change in the title card is Heavy's name. With this comparison, it appears that Heavy was once called 'Heaby', or was a simple miss to the left of the keyboard. 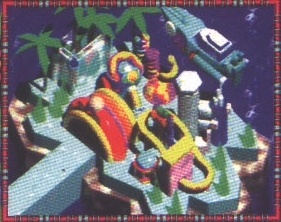 This piece of 3D artwork was supposedly one of the introduction or title shots, but was never seen in the final game. It IS however, in the manual for the game, but in Black & White.